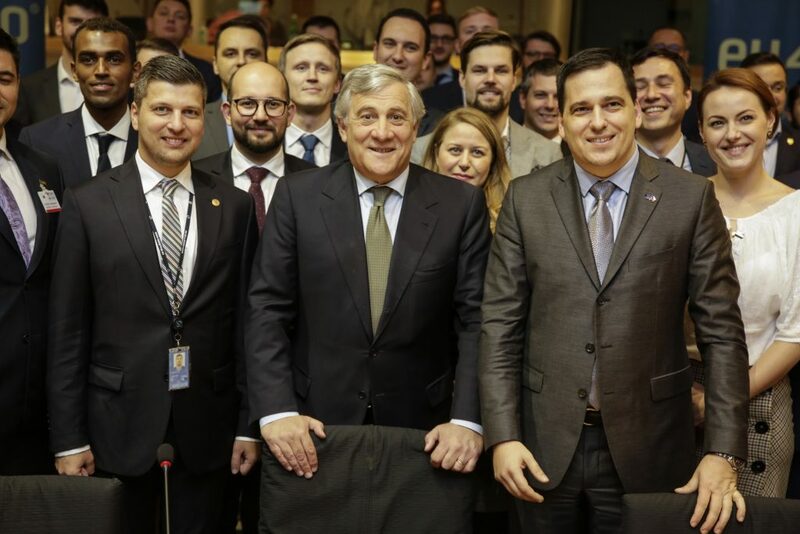 For the 3rd year in a row, EU40 brought together young Members of Parliament (under 40 or 40 years old at the time of election) from across the EU for the ‘Young Parliament Members Forum 2017′ at the European Parliament in Brussels between the 7th and 8th of November 2017, in order to generate a stronger cooperation between the national Parliaments and the European Parliament, but also to tackle some of Europe’s most urgent issues. From the ashes of the Second World War, The European Union was conceived in order to re- establish the trust between Europe’s peoples. Protecting these values remains a primary objective of the European Union. As the Young Members of Parliament Forum, we are committed to realising these values through our respective legislators. Political correctness and attempts to not lose certain electorates have resulted in the normalisation of rhetoric without meaning and strategies which never plan further than the next elections. Populists from across our continent have filled this void with snappy messages and simplistic ideas. They speak the anachronistic and dangerous language of extreme nationalism from left and right, hate and slander. It has resonated the most with those who have indeed been disenfranchised and have not seen the fruits of globalisation. We, the Young Members of Parliament Forum, vow to close this void with political substance. The complexity of our ideas must not prevent us from using clear messages and modern communication. We trust that authenticity, even if complex and challenging, will attract our populations and turn both their attention and, subsequently, their votes away from extremists and populist. We believe in the European integration project in line with the principle of subsidiarity. We may not always agree with the EU policies which are proposed and we may have ideas about how to improve the EU institutions and we recognise the strong need to improve the EU institutions. But we vow to defend our European project from within with all our might. We are conscious of the fact that authenticity and meaningful political alternatives are born in a context of sound political competition. As true democrats, we cherish the right of our opponents to speak their minds, in the spirit of Voltaire. We recognise the danger of manipulating our public discourse by presenting half-truths or ‘alternative’-facts, thereby diminishing the idea of democracy and unity within the European Union. We must insist on using science-driven fact-checked ideas throughout our public debates without ever forgetting the interests of the citizens that we represent. We must ensure that digital communication empowers our society rather than creating a smog of fake news. It has become sufficiently clear that there is a sense of mistrust in the ruling political class and even in the system of our democracy as it is. If we want to change the trend of rising populism we must rebuild the trust in politics and democratic institutions. Therefore a re-politicisation of the public space through a clearer distinction between the party programmes of our mainstream parties and clear cut answers by these parties in their respective programmes to the burning questions of our populations, such as migration, integration, climate change, terrorism and social & commercial dumping. A crucial part of the problem lies in the social fragmentation of our respective societies and we need to agree on a ‘European Social Standards Union’, in which we have a common understanding of what is socially fair in our single market. “Europe cannot work if it shuns workers”, as European Commission President, Jean-Claude Juncker, rightly pointed out in his last ‘State of the Union’. We are young politicians, who bear the passion for politics from young age and simultaneously bear the responsibility of how to drive politics forward. We are committed to sharing this sense of engagement with our respective voters. We are committed to fairly concede defeat in the political arena to our democratic opponents, should we need to – as long as our opponents are within the democratic and constitutional boundaries. We should aim to and will overcome populism, and the consequences it has created by presenting a more realistic, optimistic, and inclusive choice, taking into consideration the needs of the citizens within the Member States, but also the needs of the European citizens. A vibrant democracy might seem messy and difficult from the outside, but on the long run it has proven to be the most sustainable, just, and peaceful societal model.